The idea for these pastries came from watching a film clip on the original Walnut Whip chocolates being hand-piped and filled. I recalled that I hadn’t really done much with the Quick Chocolate Puff Pastry, other than show you the method, and since I’d recently acquired some cream horn tubes, I was all set! 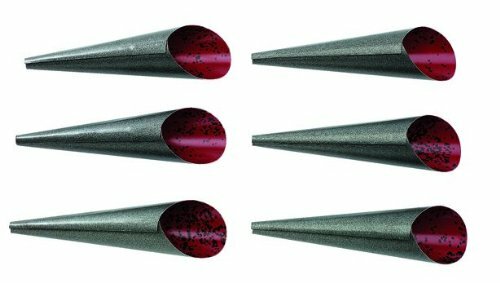 Alas, the best laid plans of tumpty-tumpty-tumpty-tum and all that – MY cream horn tubes weren’t the beautifully sleek examples pictured above, I’d gone for the non-stick style, seen below. Which meant I had to devise a way to get my tubes to stand upright in order to form the tapering cones of the walnut whip shape. 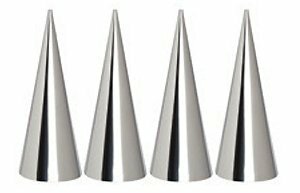 I won’t bore you with ALL of the trials and tribulations, and the various failed attempts, but I did eventually achieve success combining two differently-shaped ice-cream cones and balancing the metal shapes on top. I’ve seen a few suggestions out there that call for just covering wafer cones with foil, but that doesn’t work (caveat: doesn’t work well enough for me to recommend). To cook properly, all the way through, the pastry needs the high temperature that the metal will get to in a hot oven. Foil never gets hot enough to cook the inside of the pastry thoroughly. I tried. This is another Lego™ recipe, in that it’s made up of bits and pieces from other recipes, mixed with some new things. I’ve already mentioned the Chocolate Puff Pastry from a few weeks ago. I’ve also used the Bavarian Cream from the Sicilian Seven Veils Cake, and swapped the chocolate flavouring for coffee. The NEW bits in this creation are the candied walnuts and the Crunch Shortbread biscuit used for the base. I’m going to be straight with you – the pastries have a pretty high FQ (Faff Quotient™) – I only got a dozen usable pastry ‘shells’ from a whole batch of the chocolate pastry (mainly due to my own clumsiness, I’ll admit) – so if it all sounds too much like hard work, just have a bash at the biscuits: they’re seriously good all by themselves! To make the complete pastries involves making several separate elements, and then assembling them at the end. The whole process can be spread over a few days if necessary. I suggest shaping/baking the pastry as the last task, so that it retains its crispness. I know I said to bake the pastry last, but you should MAKE it first, so that it can thoroughly chill in the fridge, and thus be a bit easier to roll out/work with. 1. Chocolate Pastry – click HERE for the recipe and method. Sprinkle the sugar into a non-tick pan and place on a low heat to melt. Do not stir, as this will cause the sugar to crystallise. If the sugar is melting unevenly, swirl the contents around to mix. While the sugar is melting, pick out the best-looking walnut halves and skewer each half with a cocktail stick, ready for dipping. When all the sugar has melted, and is a deep caramel colour, it’s time to dip the walnuts. Remove the pan from the heat and lay a sheet of parchment paper alongside. Dip each walnut into the caramel and allow the excess to drain off. Place the walnut on the parchment and gently twist the cocktail stick free. The caramel should still be liquid enough to flow over the hole left by the cocktail stick. Allow to cool, then wrap in parchment and keep in an airtight box. The dipped nuts will become sticky if left exposed to the air. Bavarian cream is basically a custard with added gelatine, with flavourings and cream folded through. If you want to break down the process because of lack of time, it can be made in two parts. The first part is the custard base, the second adding the flavourings and gelatine when ready to use. If you do this, then warm the custard slightly before trying to stir in the soaked gelatine. Soak the gelatine in cold water to cover for 10 minutes. Whip the cream to firm peaks, then fold through the cooled coffee custard. Cover with cling film and chill until required. Roll the mixture out to between 5-8mm thick and place in the freezer to harden for between 15 and 30 minutes. Cut the chilled paste into 4cm-ish rounds (I used the rim of a small glass) and arrange on a parchment lined baking sheet. I suggest working with just half of a batch of pastry at a time, since the strips of pastry will be quite long and potentially tricky to handle. Roll the pastry out thinly (5mm), keeping the shape as straight and rectangular as possible. Try and achieve a length of 40-45cm, so that you can make each shell using just a single strip of pastry. Cut the pastry into 1cm wide strips. I find a pizza wheel works best for this, as it doesn’t ‘drag’ the pastry as a knife would. Also, your pastry might be getting a little soft by this stage, with all the rolling. If you think it’s too soft, pop it back into the fridge or freezer to firm up. Grease your cream horn tins. Pre-heat the oven to 220°C, 200°C Fan. Finish your pastry shell about half-way up your cone: you want the top to be about as wide as a walnut, once cooked. Stand your cones in the cups of a cupcake tin, for a little extra stability. Bake for 10-12 minutes until the pastry is fully cooked. Leave to cool on the cones. Once cool, ease the shells gently from the cones and set aside. Melt the chocolate in a bowl over hot water until completely liquid and smooth. Spoon the Bavarian Coffee Cream into a piping bag fitted with a 1cm plain nozzle. Lay a sheet of parchment onto a tray that will fit into your fridge (to chill the assembled pastries). Lay a piece of clingfilm on the bench in front of you. Have the pastry shells, the biscuits and the candied walnuts to hand. Take a biscuit and brush the top with melted chocolate (to prevent sogginess from the cream filling). Take a pastry shell and set it upside down onto the clingfilm in front of you. Pipe the coffee cream into the pastry shell until completely full. Use a knife to smooth the cream across the bottom of the pastry shell. Spread melted chocolate over the bottom of the pastry shell and the coffee cream, and, turning the pastry shell over, set it onto the chocolate covered biscuit, where the chocolate should ‘glue’ them together. 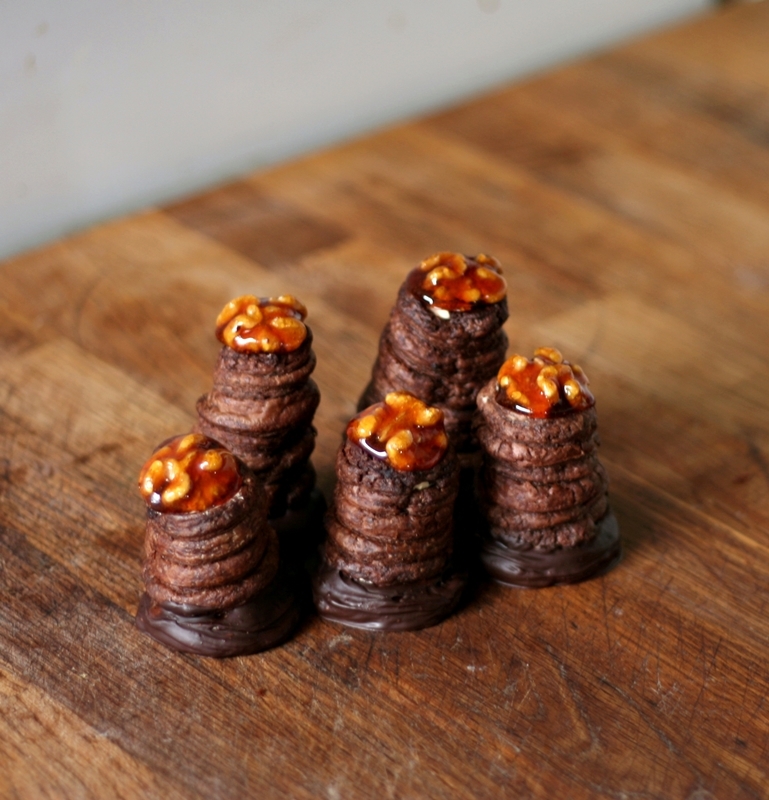 Paint melted chocolate over the top of the pastry shell, and set a candied walnut on top. Now you could stop here if you like – all the ‘pieces’ are assembled. However, I decided to neaten the pastries up by dipping the bases in the melted chocolate. The biscuit is then completely covered, and the ‘seal’ between the pastry and the biscuit itself has been recinforced with another layer of chocolate. If your chocolate has cooled too much, set it over the pan of hot water until it is melted again. When all the pastries have chilled for at least 20 minutes in the fridge, remove them and dip them in the melted chocolate. Use a pastry brush to even out the chocolate coating. Set onto parchment and chill in the fridge until required.